Presented by Dr. Dianne Oberg on June 30, 2015 at the conference of the International Association of School Librarianship (IASL). Now schools in Canada have a brand new tool to help them not only reach this goal but also advance learning for the future. 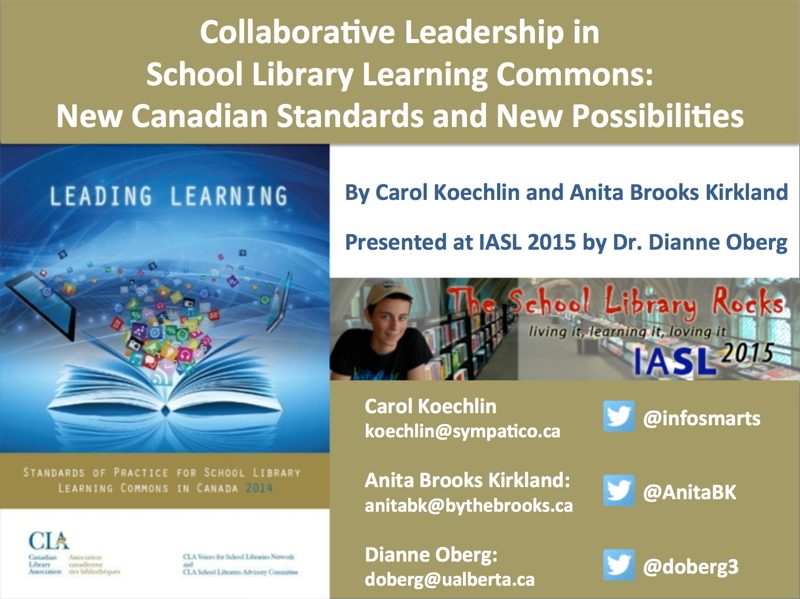 Leading Learning: Standards of Practice for School Library Learning Commons in Canada was officially launched May 30th, 2014 at the Canadian Library Association (CLA) Conference in Victoria, British Columbia. This document has many purposes. Primarily it provides a guide for the transition of school libraries to vibrant centres of teaching and learning responsive to the diverse needs of learners today and into the future. It also serves as a measurement tool to help schools determine where they are now with library facilities and programs and where they want to advance to. Standards can indeed help measure practice, but Leading Learning does much more. By focusing on the needs of the learner, Leading Learning provides a framework for growth. Every school, no matter the status of its library program, can find itself in this framework and decide on tangible steps for improvement. The development of Leading Learning brought together input from every province and territory in the country, and successfully developed standards for growth that are meaningful within this very disparate context. The process of writing the standards was very unique and modeled the benefits of working collaboratively in a networked world. A serious re-investment in school libraries as learning commons is a sustainable investment in school improvement and learning to learn today and into the future. The new Canadian standards document is a practical tool to inspire transition journeys and to ensure success. Leading Learning can be the catalyst for change, addressing the grave concerns expressed by the Royal Society’s report. We strive for educators in Canada and worldwide to consider this potential. The time to re-invest is now!